The Chinese Zodiac or Sheng Xiao is based on a twelve-year cycle, which is the time it takes Jupiter to travel around the sun. During the Han Dynasty (202 BC to 220 AD), each Chinese Zodiac year was paired to an animal that represent the qualities of the people born under that sign. The Chinese Zodiac has played an important role in Chinese culture for over two millennia. Its animal symbols have been used in stories and folklore, and are considered to be a window into your personality and foreteller of prospects in love, luck, relationships, and success. 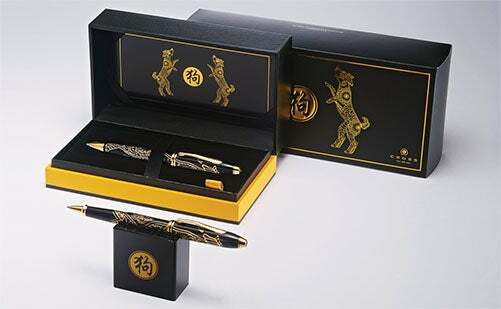 Every year, Cross crafts a special-edition writing instrument celebrating the corresponding sign of the Chinese Zodiac. Each pen features a rich lacquer finish with a beautiful deep-etched animal engraving and 23KT gold-plated inlays and appointments. A symbol of luck and good fortune, each collectible is hand-polished and presented in a luxury keepsake box. These fine collectibles were created to celebrate the corresponding sign of the Chinese Zodiac. Hand-polished lacquer finishes feature 23KT gold-plated appointments. Presented in a Zodiac Special-Edition keepsake gift box. Each Chinese Zodiac collectible is covered by a lifetime mechanical guarantee.